LinkedIn has become the heavyweight B2B content marketing platform. The platform’s acquisition of Slideshare and the development of its Pulse platform for long form content, shows it is taking content marketing seriously. I decided to take a look at what the data tells us about the state of content marketing on LinkedIn and the content that works best. Not convinced by LinkedIn for B2B marketing? Just consider some of these statistics. With almost 350m members the platform now drives more social traffic to corporate websites than all the other social networks combined. As a consequence 94% of B2B marketers now distribute content via LinkedIn, more than any other network. The key to LinkedIn though is its ability to drive leads and customers. In a 2013 survey over 65% of companies surveyed said they had acquired a customer or customers from LinkedIn. Thus LinkedIn is not simply about raising brand awareness and building an audience but also about lead generation and conversions. Long form posts on LinkedIn’s Pulse network by their influencers typcially gain over 25,000 views, 300 likes and over 200 comments. In addition, on a typical day nearly 4 million people visit LinkedIn’s SlideShare and add over 13,000 new pieces of content. SlideShare is arguably the world’s largest professional content-sharing community. 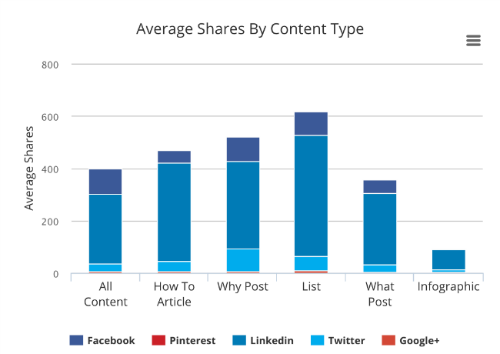 The two platforms combined provide extensive reach for B2B content marketers. 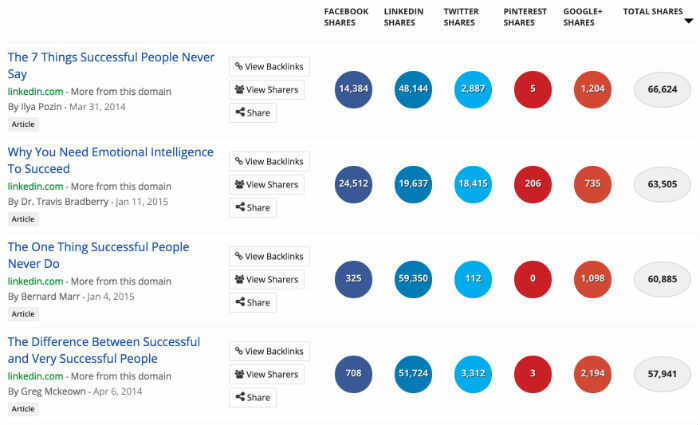 Our BuzzSumo data shows that top posts can get hundreds of thousands of shares and many posts get over 10,000 shares. These are quite exceptional levels of engagement in the world of B2B marketing. What Content Works on LinkedIn? When we look at the most shared content formats on LinkedIn’s Pulse network we can see that list posts perform best and infographics the worst. Despite being a long form content platform, it appears that content of over 3,000 words performs less well on the Pulse network in terms of shares. Short posts of less than 1,000 words also perform poorly. The ideal content length is between 2,000 and 3,000 words. Many people are looking for career development tips and advice. They are also keen to share content which provides practical advice to help you be more successful. The word ‘success’ is important, for example see the posts below. The four posts above averaged over 60,000 shares. They all have ‘successful’ or ‘succeed’ in the title and they are all posts that promise to help you be more successful. Posts about strategy and trends work well on LinkedIn. Here are some examples below. Notice that the top post combines both a list post and a trends post. 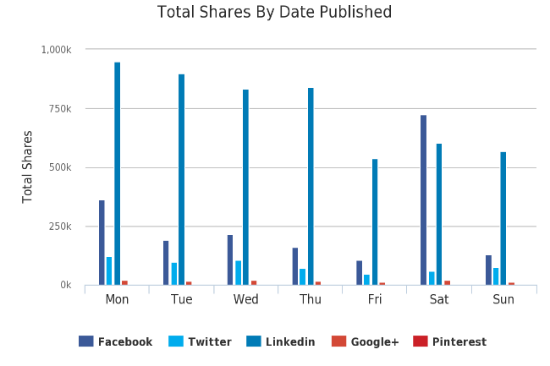 Content published early in the week tends to get more shares. Whilst Friday is not a great day to publish, it is surprising that content published on a weekend, both Saturday and Sunday does relatively well on LinkedIn. How does this compare with your own experience of LinkedIn publishing? Nice insights – how many pieces of content did you look at for the bar charts? Hi, we looked at just over 20,000 articles for this review. 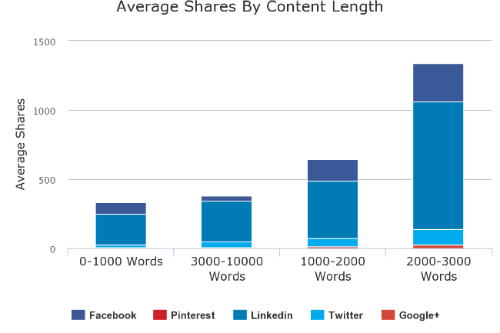 You can run a content analysis report for Linkedin.com/pulse to see data for the last 10,000 posts. Let me know if you need anything else.